Roast and powder the cumin seeds & the peppercorns. Grind together the coconut & cumin seeds. Heat the oil in a pan and add the mustard seeds, asafoetida and red chillies followed by the chopped onion and garlic. Sauté till the onions are transparent. Add the roasted powders and the ground coconut-cumin seed mixture. Mix well and cook for 3-4 minutes. Add the cooked beans to this and ½ cup of water & cover and cook for 5 minutes or so till all the flavors blend in. Heat the oil in a pan and add the ingredients for the seasoning. Add the chopped onions & garlic and sauté till the onions are transparent and soft. Add the cluster beans and cover and cook till tender. Add the ground coconut mixture to the beans and mix well. Cook for another 3-4 minutes. Cluster beans are a little too bitter for my taste and I added a big piece of jaggery too. Mix well till the jaggery melts. You were in a beans mood. Both the dishes looks very nice. Both curries look so good TBC. I've not bought Moth beans before, are they like red chori but brown in colour? My mom always makes paruppu usli with cluster beans.. this is a nice variation. ooh! matki is my fav, looks delicious :) good tip @ freezing. guvar/coconut combo sounds & looks good! Nice looking curries. Adding a bit of jaggery to guvar is a nice idea. Usually, I add sugar. Moth beans curry looks great too. Thanks for sharing. 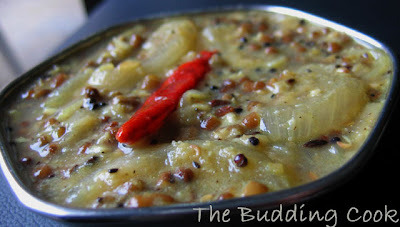 oh, wants to get some rice with it..
Hi TBC, cluster beans curry looks awesome and might be delicious. Never heard about these moth beans. Will try them soon. Thanks for sharing. I love moth beans! Will try it this way next time. Both preparations look yummy! I have never eaten moth beans. Both of your subjis look delicious.Are they Kerala style preparations? Strangely enough, cluster beans is one my favorites ( not many peeps like this veggie). This method looks really nice and appetising. Liked the idea of preoaring before hand and storing in the freezer! Nice dish TBC! 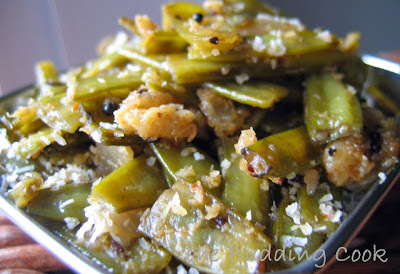 I love cluster beans with coconut combination. sounds yum! i love both your dishes here TBC... they are of my fav ingedients but cooked so differently... great post! Laavanya, I am not very good with the names of all the difft types of dals:-( I only know the most commonly used ones. Sreelu dear, let me tell u a little secret-I used the frozen ones;-). Tee,let me know how u like it when u make it. Padma,I am not too fond of wither of them but I make it occasionally. Mansi, how do you guys make it. Would love to hear your version. And u r welcome... see, blogging is not such a waste of time after all as some people think:-).You just learnt something. Coffee, do post your recipe when u get a chance, or is it already there on ur blog? Suma, no they are not Kerala style preparations;I think they are Maharashtrian dishes...not sure. Nupur, thanks.I am sure you can use the frozen beans in just the same way as you would the fresh. I used the frozen ones. Cynthia, that is so true:-)It does almost sound like one of those things that you would eat on Fear Factor. I have a whole bunch of other tips too but most of them have already been mentioned on a couple of other blogs. Sona,thank you :-)You are very generous with your compliments.The slideshow had some pics that were "color-splashed"
Mother Beans and Guvar Curry both looks delicious. You present this guvar curry in some different ingredients. Have never seen such a lovely presentation of Cluster beans. Love cluster beans, can never say no and cant stop buying even if they are frozen and the hubby detests them... If I had a chance, I would cook them everyday!! Dee, welcome back! where have you been? I am not too crazy about this vegetable or the dish but it was a little different from my normal preparations:-). Cook them everyday?...I can do that only with potatoes!